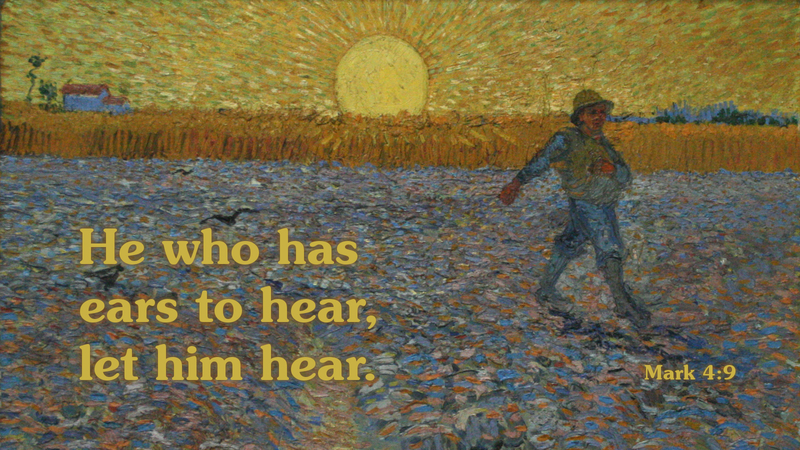 As many will know from Sunday School classes, the seed of the sower is the Word of God. The Word of God is spread throughout the world, here and there, falling on the path, on rocky ground, among thorns and some on good soil. In Jesus’ time, there was no plowing the ground into straight lines, dropping each seed carefully into the hole. While the ground was often plowed or broken up, still the sower would spread the seed “broadcast” style, so that the wind would take it and carry it beyond the prepared field. Not as efficient as our modern farming techniques, but remember, Jesus isn’t really talking about farming, but about the spreading of God’s Word. We can be thankful that God’s Word is cast freely, openly without concern for where the seed of His Word might land. That’s how it is with preaching on Sunday morning—as the preacher proclaims the Word without concern for how it might or might not be received. It’s not my worry as a preacher whether you will hear and take to heart God’s Word. The soil of your heart is God’s concern. Once the seed falls on your ears, it’s up to God whether it will take root and grow. However, that doesn’t keep Jesus from exhorting His hearers, saying, “If you have ears, listen to what’s being said!” This makes me think of Orthodox priests who declare before the reading of the Word of God in the liturgy, “Attend! Let us be attentive and hear the Word of God!” Isn’t that what Jesus is saying in our reading, when He says, “He who has ears to hear, let him hear!” What a shame to have the gift of hearing, but not listen and hear what God says to us through His Word. Throughout the season of Lent, let us open our ears to hear. Let us receive the seed of God’s Word so that it will take root and bear fruit in our lives, by God’s gracious power and action! Prayer: Almighty God, make our hearts good soil, so that as we hear your Word, it will be received in faith, and bring forth fruit; through Jesus Christ, your Son our Lord. Amen.